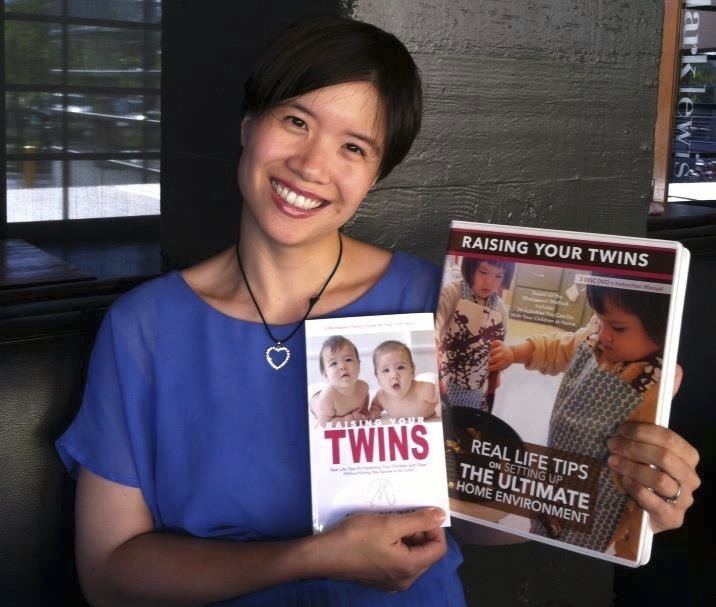 A lot of people have been asking me questions about the difference between my book, Raising Your Twins: Real Life Tips on Parenting with Ease (Without Kicking Your Spouse to the Curb) and my DVD, Raising Your Twins: Real Life Tips on Setting Up the Ultimate Home Environment. Here are the answers to some commonly-asked questions. 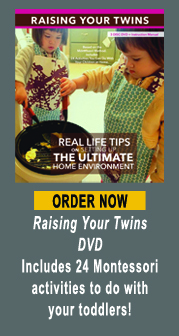 Does the Raising Your Twins DVD contain the same content as the Raising Your Twins book? No, the book and the DVD cover different ages, so they have different content. The book covers newborn to 18 months. The DVD covers ages 1 to 4 years old. I only have one child, will this work for me or is it only for parents with twins? Don’t let the title fool you! Everything in the book and DVD will work for you whether you have one child, two young children close in age OR multiples. If it works for two children, it will work for one! Does the DVD contain similar content as your Youtube vidoes? The DVD is much more comprehensive. It was shot over 3 days with a professional videographer. With over 30 hours of footage edited down to 2 hours, only the best footage made it to the DVD. You’ve seen B and M put on jackets and make scrambled eggs on Youtube, but in the DVD, you will learn exactly how to replicate it at home with your child, including what you need to buy and prepare, how to present the activities, and the whole ‘why’ and ‘how’ behind every activity. The DVD covers everything from language, fine motor skills, care-of-the-self, care-of-the-environment to kitchen skills. If you are able to apply everything in the DVD, you will have an excellent Montessori home environment. How old were your children when you filmed this? How many episodes are they in? This DVD was filmed over 3 days on their 2nd birthday. You will see them in action in Episodes 2 through 8. What can I get out of this DVD? This DVD contains an incredible amount of valuable content. In this 121-minute, 8-episode series, you will learn how to set up every single room of the home as well as how to set up and do 24+ Montessori-based activities with your children. You will hear me talk about the big picture behind your child’s development, see actual children doing the work and receive a detailed instruction booklet, complete with pictures and resources. This DVD is essential for parents who want to raise a child the Montessori Way at home. It’s for the home-schooling parents, the parents who can’t find a good Montessori school nearby or can’t afford one, the parents who want to prepare their child for Montessori in the future or for parents who just want to try it out. On top of all this, you will get a complimentary 30-minute consultation with me, if you choose. This DVD is originally priced at $147, but is currently on sale for a limited time for $97. I can guarantee you will not find this much valuable content for this price anywhere else. I’m a nanny. Will this be helpful for me? Absolutely. There are many activities you can do with the child you take care of. The Back to Basics and Language episodes will be particularly useful for the child under 18 months. By 18 months, all the episodes will be applicable. If you don’t have a background in child development, there will be lots of helpful information for you. If you do have a background in child development, you will get lots of ideas for new activities. What’s in each episode, exactly? In Episode 1, I give you a tour of my Baltimore home and show you the most important components to consider for your child when designing each room in your home. Includes the bedroom, bathroom, kitchen, dining room, play area, dressing area and cleaning area. In Episode 2, I show you several easy, basic activities for the youngest toddler. I guarantee your child will LOVE at least a couple if not all of them. 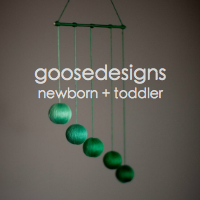 AND they are essential building blocks for good gross and fine motor skill development. In Episode 3, I show you how to teach your child to put on different items of clothing and accessories. Includes detailed description of what to look for when you’re shopping for clothes. B and M demonstrates how it’s done. In Episode 4, I show you some activities that parents automatically do for their children. Teach your children to do these things and your life will get so much easier. In Episode 5, I show you some essential fine motor skills, including how to teach your child to cut with scissors, glue and sew with a needle. The goal is not to prove how capable your child is. The goal is to engage your child in activities they enjoy. And they will love some of these. In Episode 6, I give you strategies on how to maximize your child’s language ability. What will bring out the best language skills? What can you do to make that happen? What activities will enhance those abilities? What are the best books to read? How do you read to a child? Find out the answers and way more in this episode. Where can I buy the book and DVD? The book and DVD are both available through www.RaisingYourTwins.com. The kindle version of the book is also available through Amazon here. Yes, we do. You will have the option of entering an international address at check-out. We ship out new orders everyday (except Sunday) from Portland, OR through USPS. If you are on the West Coast, your order will arrive sooner than the East Coast. USPS guarantees your order will arrive within 7-10 business days. If you are dissatisfied with the book or the DVD for any reason, return it and you will receive a refund, no questions asked. 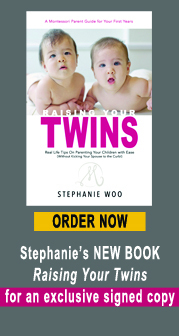 Visit www.RaisingYourTwins.com and you will be able to order the book, DVD or both!